These tools are excerpted from Adobe After Effects CC Visual Effects and Compositing Studio Techniques by Mark Christiansen. (c) 2013. Published by Adobe Press. All rights reserved. A complete chapter on scripting by Jeff Almasol is included with the book. rd_Duplink.jsx: Displays a palette with controls for creating linked instances of a selected layer's properties. These links are made via pick-whipped expressions, so only those properties that can use expressions can be linked. 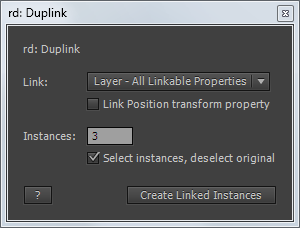 Create duplicates or "instances" of a layer, which allow you to change the main layer and have its instance layers update as well. rd_LightWrap.jsx: Creates the light wrap effect using the technique described in the Light chapter of the book. In addition, it adds a Contamination and Wrap Offset controls to the precomp layer for easier adjustment, and ties the position, scale, and rotation properties from the foreground and background layers to those in the precomp to synchronize any transformations you decide to do. rd_MergeProjects.jsx: Displays a palette with controls for merging a selected project folder's contents up to the root of the Project panel. 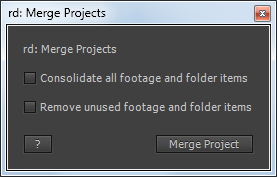 Use this tool when you have imported a project into another, and want to merge subfolders and their contents with existing same-named subfolders at the root-level of the project, keeping your Project panel more organized. rd_Slated.jsx: Renders slates, single-frame images of a specific template composition whose data is fed by the information in a text file exported from a spreadsheet. rd_TrimToZeroOpacityKeys.jsx: Trims the transparent ends of the selected layers by trimming to the first and last Opacity keyframes with zero value. rd_TrimZeroOpacity.jsx: Trims the transparent ends of the selected layers by trimming to the first and last frame that doesn't have a zero value for Opacity. Unlike the rd_TrimToZeroOpacityKeys.jsx script, this one will evaluate expression values and also trim as much as possible (if multiple adjacent frames have the same zero value). Because multiple frames can be evaluated per layer, i might take a little longer to process lots of layers. Round mask/shape layer corners with a click! Vertex Tool applies rounding algorithms to a shape by placing two (in some cases more) new vertices in place of original one at selected corner, based on a specified line length. There are 12 corner rounding algorithms to choose from.